Pregnant? Experience yoga in a safe and relaxing class for you and your baby. Prenatal yoga can help promote calm, relive aches, and more by coordinating breath with movement. Poses are modified to accommodate a growing belly, strengthen the pelvic floor, support the core, and increase stamina. Kids and adults with special needs can also benefit from yoga. Each class is tailored for the individual with modification based on the physical and cognitive limitations. Special needs yoga aims to ease tight muscles, increase body awareness, promote a calm focus, free the mind, and decrease stress and anxiety. Restorative yoga is therapy-oriented yoga which helps recover strength, calms the nervous system, and eases tension in the body. Learn to align your body and breathe with gentle movements and poses with and without props. Those new to yoga and/or with physical limitations can learn yoga in a safe and supportive environment. 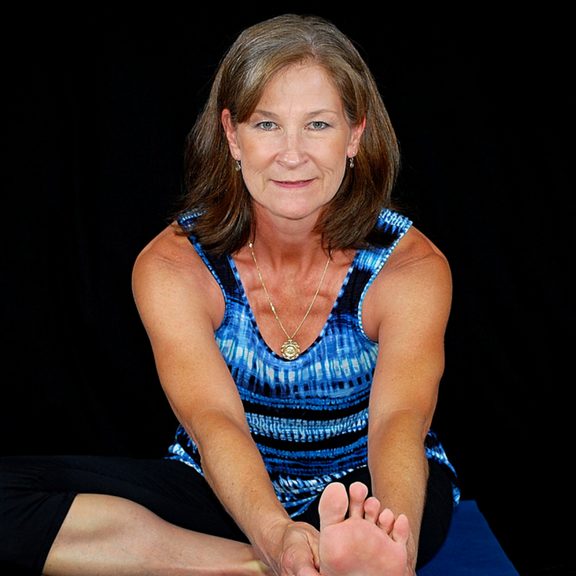 Susan was first introduced to yoga about 17 years ago when she moved to the Atlanta area. Knowing that yoga eased her chronic low back pain she decided to obtain her yoga teacher certification in order to help others. She is a 500RYT and RCYT. Her emphasis in teaching has been on yoga as a therapy and children’s yoga. Her studies have included program hours in yoga for adults, children, prenatal, PTSD and individuals with special needs. Her goals are to provide restorative yoga, yoga for special needs, and prenatal yoga. Susan and her husband, Jim, are the parents of two daughters, Lindsay and Sarah, who have graduated college and are now living/working in the area. She and her husband, and their three dogs live on a small farm in Alpharetta with free-range chickens, bees, and an organic garden. Susan also loves to paint landscapes and portraits, play tennis, and read. Private yoga classes are available for $50 per session. You can also form your own small group. Call or email if you are interested. Susan would be happy to speak with you to discuss if a Specialty Yoga Class is the right fit for you. Feel free to fill out the form below with questions, appointment requests, cancellations, and more. You can also all us at 678-629-3988. We’ll do our best to get back to you soon. Sign me up for the newsletter so I can hear about events, updates, and offers! Be a part of our community! Register here to be the first to hear about news, special events, and member offers. © 2011-2019 Copyright All Worlds Health & Pediatrics, P.C. This website is not intended to diagnose, cure, or treat medical conditions, nor is it to be used as a substitute for advice from a qualified health practitioner. The purpose of this website is informational only. If you need medical advice, please consult directly with Dr. Dijamco or another qualified health practitioner directly.